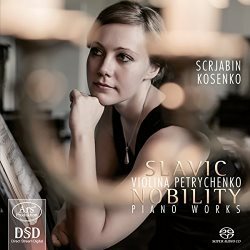 For her solo CD debut disc Ukrainian pianist Violina Petrychenko has chosen piano works by Scriabin and fellow Ukrainian Viktor Kosenko. Kosenko remains little known or recorded though the declared world première recording of his second piano sonata is in fact erroneous since its debut on disc was by another Ukrainian pianist Natalya Shkoda on Centaur Records CRS 3109 back in 2011 on which all three of his piano sonatas are presented. That said this disc is interesting because of the similarities between the two composers: one born in Moscow, the other in St Petersburg, both of them admirers of Chopin, Kosenko also of Scriabin, and both of them dying at tragically young ages robbing us of so much more that they might have written. Petrychenko’s programme is one that encourages comparisons with her playing similar works by each composer. The otherworldliness that characterises Scriabin’s music is immediately apparent in the first of the 2 Poèmes op.32. Its simple lines transport the listener away from the cares of the world while the second is much more powerful. The first of Kosenko’s two poems also embodies a dreamy quality with the second again a more striking affair. We then have three mazurkas by each of them, both sets being their op. 3, in which Chopin’s influence is marked. That said, each of them stamps his own very different personality upon them even if Kosenko’s mazurkas are especially Chopinesque. The latter recall an age well before that of their composition. Scriabin’s two movement piano sonata, dramatic and dreamlike by turns, is ‘classic’ Scriabin. Kosenko’s three movement work could also be thought to come from the same stable if we were not told of its composer’s identity. However, similar in nature though it may be to his idol’s work, Kosenko’s sonata has an originality that would surely have been further developed had he lived longer than his 42 years. Its central slow movement is an extremely affecting song without words. The title of the disc — Slavic Nobility — refers to the fact that both composers came from noble families. It also alludes to the music which has a noble quality. I can take as much Scriabin as record companies can throw at me and now I find that Kosenko’s music is just as infectious. I’m hopeful we’ll have more such discs coming our way. From what I’ve read there’s plenty more to explore from this little known composer. Petrychenko who has made her home in Germany is perfectly at home with all this music and plays it with both commitment and affection. The disc is very well recorded. I counted three different spellings of Scriabin on this disc: Scriabin, Scrjabin and Scriabin. The latter is the one ARS put against the track listings but I prefer Scriabin.